Gary Rose talks about the hobby of scripophily, or collecting antique and vintage stock and bond certificates. Based in Uxbridge, Massachusetts, Gary can be reached through his site, Certificate Collector, which is a member of our Hall of Fame. I got interested in stock certificates by happenstance, really. I collected stamps at one point, and sold my collection to put a down payment on the house. I tried to get back into stamp collecting by going to an auction a year or two later, and ended up not buying any stamps. But at the end of the auction, I bought some stocks just because I hadn’t bought anything. I found them interesting and started picking up more and more pieces, and the next thing I knew I was collecting pretty heavily. Milford and UxBirdge Railroad Stock. Issued in 1909. #392. Perhaps unique in this early variety where the car travels right. There’s not really much of a tie-in between stock certificates and stamps except from the standpoint of engraving. 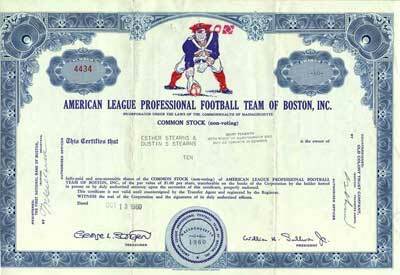 Typically stock certificates are more aligned with banknote collectors, who in turn are tied in with coin collectors. Scripophily, which is the term for stock certificate collecting, loosely translates to the love of paper. I’ve been collecting for about 15 years now, and I focus mostly on New England material. You have to focus on an area. Some people focus on an industry. I collect all industries, though I really like the old mill stocks. But there’s only so many of those to go around. When I say mill stocks I mean from the turn of the century, the earlier mills from the Industrial Revolution. Being here in the Blackstone Valley, it’s the cradle of the whole mill experience in America. So there’s some good material. I’m also very large into railroad, mining, and banking stocks. I even have a stage-coach certificate I’m really fond of. But people collect just about anything – guns, machines. I’ll collect anything as long as it’s 19th century or earlier. I find it all interesting in terms of the economic history of the New England area. The railroads and the mills played a big part, but New England was also a major banking center. And in turn, the banking center funded a lot of mining efforts and so forth, even in other parts of the country. So there’s some really good stuff from the financial side. Collectors Weekly: What are some of the well-known names you’ve collected stocks from? Rose: There are some pieces every collector has to have. I have a Standard Oil Trust piece signed by Rockefeller. But for the most part, I’m not as interested in the big-name companies as much as the smaller players. I prefer the Blackstone Canal stock certificate because it’s local and had such an important economic effect on the area. First National Bank of Danvers. Stock. Issued in 1900. #866. One of the interesting things about stock certificates is that they’re highly cross-collected by people who also collect other things. I have friends who model railroads, and they all want stock certificates to hang on their wall that match the railroad they’re modeling. 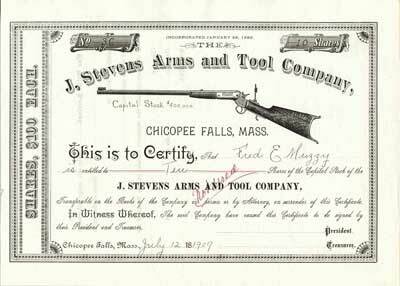 People who collect guns want to collect stock certificates from the Old West gun manufacturers. People who are into mining will collect anything from mines in a certain area including the stock certificates from those mines. People interested in Hollywood and movie stars are always looking for certificates that were either issued to or signed by famous actors or actresses. I know at least three or four people who have stock certificates from early plumbing companies that show early toilets on the certificate as a vignette. These people have that certificate framed in their bathrooms. They don’t collect stock certificates, it’s just a coordinating piece with the bathroom. 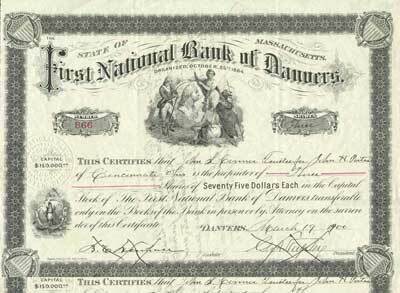 Collectors Weekly: Do the stock certificates themselves differ from region to region? Rose: Mostly by industry. In New England, you can find some mining stocks that actually mined in New England, but it’s not that common. But if you collect Nevada or California or Arizona or Colorado, there were lots of mining locations from those areas. Railroads are pretty much common throughout the country, but banking was more centralized in the bigger cities like New York and Boston. 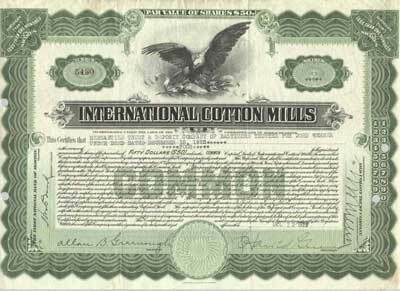 International Cotton Mills. Stock. Issued in 1922. #5430. I do also have a fascination for the engravers’ art, which probably comes from my stamp collecting background. I’ll collect any piece that’s really aesthetically pleasing, whether it be engraved or lithographed, regardless of where it comes from, it has great aesthetics. A lot of the older certificates will often show detailed engraving. They have a really nice image – what we call a vignette – of the product that the company makes. I’m very attracted to those certificates as well. There were artists doing the engraving, and some collectors look for very specific work done by certain people. There were a couple of major companies that did the work, like the American Bank Note Company. In the Boston area, there are various printers that turn up a lot and some certainly did better work than others. One was a company called Goes. They produced a lot of stock certificates, some very plain and ordinary, and some highly decorative. The vignette is the most interesting part of a stock certificate, and will usually be an image of some sort, anything from an allegorical figure to the company’s product. Sometimes a portrait of the company’s founder. It’s generally that image you see in the upper center portion of most stock certificates. On the railroads there will usually be a train of some sort. The more unique the image, the more valuable the piece and of course the more aesthetically pleasing. In Massachusetts, because it was more conservative, a lot of stocks are not as ornate as stocks from other regions, but there are exceptions. The vignettes came from different places. The printers often had pre-printed forms with a vignette already on it. So a company could just print their own name onto it. Other companies were really trying to use the stock as a sales tool for shares in the company, and would invest more and have the printer design a custom vignette. Those were the two extremes. In between, most 19th-century certificates were basically semi-custom forms. You chose a vignette from a catalog, and they printed the certificates for you with your company’s name on them. Collectors Weekly: Where do you usually find stock certificates? Rose: It’s changed over time. When I started, I had a lot of success finding them at paper shows, even some stamp and coin shows, but mostly paper shows. There were a number of dealers around who had a few shows a year and one very large show every January in Pennsylvania. I’ve picked up a lot of what I have through that show. And then the Internet came and eBay. In the early days, it wasn’t dealers selling online, but people with just 10 items were putting them out there. Now it’s mostly dealers so it’s not the bargains I used to get. Fortunately a lot of stock certificates survived in really good shape, because people tended to keep them vaulted in safes for long periods of time, or they got archived. A hundred years ago, if you had a share of stock and sold it, you would turn it in. That certificate would make its way back to the company and very often they would literally be glued back into the book it was originally printed in (and torn out of when it was issued to you). The company would essentially file them away and put them in a company archive. And every once in a while, still today, there’s a discovery of a new archive that hits the market. 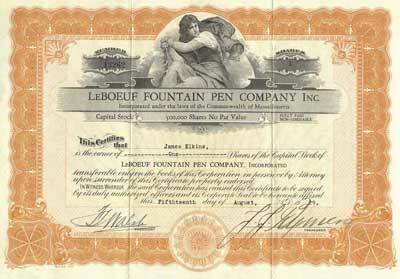 LeBoeuf Fountain Pen Company, Inc. Famous Springfield pen producer founded in 1921. Stock. Issued in 1929. #43262. The most valuable certificates, though, are ones that don’t come out of archives because when they come out of an archive, by definition, there’s a lot of them. The more valuable certificates would be the ones that were never cancelled, never turned in, the company went out of business, the archives got burned or destroyed, and there are only a few certificates that were kept in somebody’s bottom drawer for a hundred years. Stock certificates are a little different from banknotes or coins or stamps in this respect. There may only have been 10 printed of a given certificate, but it doesn’t mean they’re worth anything because they may not be great to look at or from an industry that anybody cares about. They’re not signed by somebody important. The fact that it’s rare really doesn’t help the value that much. But if a piece is collectible for another reason, and there are 10 or 15 or even less, it can be worth extreme amounts of money. Down in Pennsylvania at an auction I saw a Standard Oil Company certificate sell for, I believe, $127,000. The most I’ve ever paid has been closer to $2,800. If you have a stock certificate signed by Rockefeller or Morgan, it’s worth money. Or Ford Motor Company signed by Henry Ford. It doesn’t matter how good looking it is or isn’t. That’s the first component for value. The second is the aesthetics, combined with the condition. If it’s in bad condition, it doesn’t really matter how good looking it is. If you can’t display it, it’s just not as interesting. Collectors Weekly: What eras are popular with collectors? Rose: The older the better was pretty much true up until the dot-com crash in 2001. That event oddly enough created a whole new genre of collectors who started collecting dot com stock certificates. I don’t follow that end of it much. Some people go after the real early stocks, the stocks that dealt with the early founding of the country, 18th century and very early 19th century. The majority of collectors really come into play from the 1830s to the 1880s, and that’s mostly because that’s when you had the real build-out of the Industrial Revolution. When we put the railroads. When the larger mining firms came into being and much of the early infrastructure was put down. There’s a guy in Boston who has a stock certificate that’s signed I think by Alexander Hamilton when Hamilton established the banking system. But that’s an exception, you really don’t see many until you get into the 1790s and it was the 1800s before they were produced in quantity. I think the earliest one I have is a 1783. Collectors Weekly: Is the hobby of Scripophily growing at all? Rose: It was growing very rapidly up until 2001 or 2002, because so many more people started investing in the stock market in the ‘90s, and gained an interest in how stocks worked, how shares are traded and sold. But the downturn in the economy then slowed it down a little bit. It does seem to still be expanding. Interestingly it’s a more common hobby in Europe than here, and some of the largest dealers and the biggest collectors are actually in Europe. I think they just got started on with it earlier. There are a lot more certificates to choose from when you talk about European certificates. They have the history of older economies and so forth. And with the weak dollar, the European buyers have been very active out there. Sports is another area that’s picked up a lot, because there’s so much more interest in sports nowadays, and the growth of these sports teams. There are some very interesting certificates, especially in baseball for various old-time leagues and teams. They’re highly cross collectible. Collectors Weekly: Are there related ephemera that you also collect? Rose: There are bonds, and there are receipts. And of course I do collect ephemera when I can around the companies whose stocks I collect. 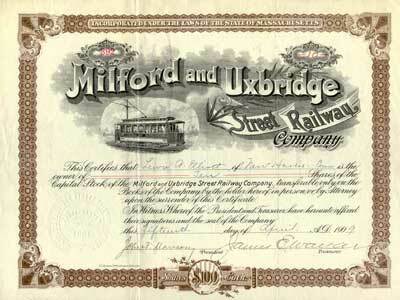 One of my favorite pieces, though not a very expensive piece, is a Milford and Uxbridge railroad stock certificate. It was a little trolley railroad that ran from the town I live in to one that was three towns away. I have that stock certificate, so I’ll look for other things related to that company. A sales brochure or flyer, for example, that dates from the same time as the stock. Collectors Weekly: Any advice for somebody just starting out with collecting stock certificates? Rose: One of the most important things is to be able to quickly distinguish a valuable stock certificate from just a very ordinary one. A lot of the places you might find stock certificates, the people selling them don’t necessarily always know much about them, and so often their pricing is very wrong, either very high or very low. And so it’s crucial to understand what to look for, what makes a piece collectible versus just ordinary. Stock. Issued in 1960. #4434. The vignette is the colorful mascot of the Patriots that was used from 1960-1992, affectionately called Pat Patriot. Collectors Weekly: How does scripophily compare with collecting stamps? Rose: I find it significantly different. Stocks are much more interesting historically. Just about every stock in my collection, I’ve researched the company. A single stock can actually keep me busy for days. You try and research the company and see when it existed. Did they make anything important, was there anything special about them? They’re almost artifacts of history, more so than stamps. With stamps, it was like that’s a wonderful engraving and it’s rare. The other difference is that it’s easier to share a stock certificate. If you have a great-looking stock certificate, even if it’s inexpensive, you can frame it, put it on a wall and it makes a very good work of art. Stamps, just by the nature of their size, don’t. I found some old stock certificates, one for the international cereal company dated 1917 and the American flour and cereal mills company dated 1916 and was wondering if you had any information on these two mills from Minneapolis MN? I have several original stock certificates of Pan Am Airways, the oldest one dated 1980 thru 1991. Can you tell me if they have any value. Thank you. We have an Indiana-Colorado Mining and Milling Company for 14 shares dated April 8 1908. It was issued to our adopted grandma’s dad and found in her home that she left to us. It is in good shape. Is it worth anything? It even has the original tattered envelope from 934 Main Street, Anderson Ind. that has a drawing of the company building and postmarked April 10, 1908. We don’t know where to look for information. Anything will help. I have 2 certificates from the Maryland Mining Company dated 1867. Do they have any value? I have some old Comon Stock notes that are cancelled from 1929 1930 and 1940 from The Nevada California Electric Corporation, Incorporated under the laws of the state of Delaware. How much can they be worth ?The lithograph depicts two women a Doc and small boat and a steam locamotive. thank you for your time. I have 2 stock certificates from M.W.SAVAGE FACTORIES,INCORPORATED. They are dated sixteenth of May 1911 and say $10 at the bottom. My wife wants to know if we should toss them or not. They are from her Grandmother. ??? Can anybody translate the old ‘legalese’ on a certificate and an attached letter? “Grace Lake Gold Mines certificate; Issued on Dec. 24, 1928 to my grandfather for 0407 Fully paid shares Of Common Stock Without Nominal or Par Value in Grace Lake Gold Mines, Ltd.” WHAT DO THESE TERMS MEAN? Then a letter from Exec. Office addressed to my grandfather from A.E.Costello, Sec’y-Treas: Signed & dated New Year’s Eve, 1928. It reads: “Please find certificate #— for 407 shares in Grace Lake Gold Mines, Ltd. in full payment of a mortgage note held by you against the Wisconsin Skead Mines, Ltd. as per receipt on loan of mortgage note to this office for cancellation…..” etc. WHAT DOES THIS LEGALESE MEAN? Thanks , I’ve just been looking for information about this topic for ages and yours is the greatest I’ve discovered so far. However, what in regards to the bottom line? Are you sure about the source? I have a certificate for The St. Louis-Kentucky Oil Company for 10 shares. It was purchased by my Grandfather, W.M. Hardy on August 13th, 1903. Price: $100.00 per share. What happened to this company. Sold to him by G.O. Lerry? out of Nashville, TN. Company was incorporated in South Dakota. Beautiful momento. .10¢ each. Company was based in TX. i found a capitol stock Certificate for 25 shares of Lakeview oil company that my deceaced grandfather never cashed in on can my dad cash it in means he is the sould heir? I have a Garrison Mining Company capital stock certificate 1000 shares, Par value indicates 10 cents, dated 12th day of Sept. 1952. Signed by Rupert Garrison. Was purchased by my Grandmother. Company incorporated in Washington State. The certificate is in excellent condition. I have a stock certificate that was my Grandfathers for 10 shares of Missoui Iron & steel, dated 1920,has gold raised seal dated1917. It was not cashed out due to the company went belly up. Could you tell me if this stock is worth anything. The par value was $10 a share. the condition of this certificate is in excellent condition, per my father years ago, it was kept in a box and placed in a plastic type protector unknown the yr it was placed in protector. Anyone have any information on the history of Savidge Tractor Manufacturing Co. from 1921? creek county hardware 1902,ok.,i have capital stocks,anny clue on this? “ ” My mother never spotted anybody sporting a scarf without reminding me that Isadora Duncan had her head pop off.